SQL Injection Mitigations – Is SP_EXECUTESQL enough? 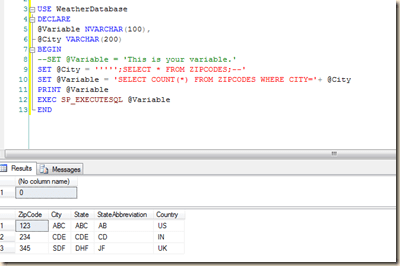 If you are writing Stored Procedures in SQL Server and your code got through a security code review, the chances are bright that you heard the terms “dynamic sql”, “sp_executesql” in the context of SQL Injection. This procedure, if used correctly, can help mitigate SQL Injection attacks to an extent. The table I used is detailed in my blog entry here. 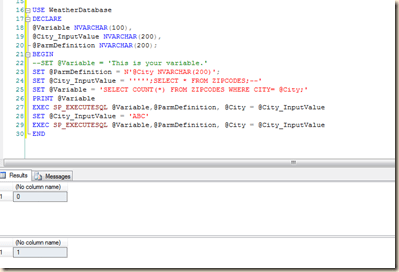 As you can see a well crafted SQL query in the input can still get me the details not meant to be shown. This can be avoided if I use a properly parameterized implementation of sp_executesql, detailed below. As you can see when parameterization is used correctly even a crafted value cannot be used to manipulate the results returned by the query. So use SP_EXECUTESQL does help mitigate the SQL Injection attacks only if parameterization is used properly. I am trying to understand the internal workings of sp_executesql, for now [:)]!